SAN FRANCISCO -- The AIM West Conference began today with a memorial for Darrell Standing Elk. Darrell was honored by his family, friends and Tony Gonzales. Darrell was remembered for his spiritual guidance, his humor, and the warmth of his love that he blanketed on others. Darrell was honored, and Russell Means was also recognized. Darrell's daughter Sue also pointed out the missing and murdered Indigenous women. Right now Dennis Banks granddaughter Rose Downwind of Minnesota is missing. During the afternoon session on Saturday, Mike Wilson, Tohono O'odham, described documenting abuse by the US Border Patrol and an increase in violence toward O'odham. 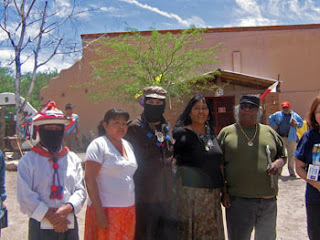 "The Tohono O'odham tribal government has completely surrendered to the US Homeland Security." Wilson said people ask why, if the Tohono O’odham is sovereign, is the US Border Patrol on the Tohono O’odham Nation. "In Indian country, we are not sovereign nations, we are not even sovereign people,” Wilson said. Wilson described how the US is building 15 camera surveillance systems on the Tohono O’odham Nation. "It is not only Tohono O'odham Nation." Wilson said that what goes on in Tohono O'odham country can happen on any tribal land. He said Homeland Security has jurisdiction on any tribal land in this country. Wilson said if tribal governments are not protecting tribal members, "What recourse do we have in a civil society against systemic violations by the US Border Patrol." Meldon Fulwilder, O' otham, Salt River Pima, described how the Border Patrol pulled him over at gunpoint. 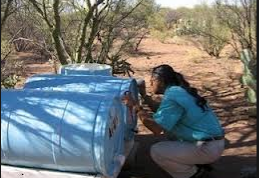 Meldon described how the US Border Patrol agents pull over the O'odham elders and search their vehicles. Meldon described a sacred run to the sacred sites in the Tohono O'odham area. He said it is now hard to cross the border to sacred places. He said these traditional routes should be available for crossing for the traditional people. "That's how it is done here." "The Border Patrol is out of control." Meldon said the traditional people still go into Sonora, Mexico, to the sacred places and people, but there are these obstacles. Meldon said on Salt River Pima, the ceremonies are being brought back. It was the loss of Gila River water that brought the ancestors of the people to Salt River. David Garcia, Tohono O'odham, described efforts with the ACLU to document abuses by the US Border Patrol agents. "More and more people are stepping forward and sharing the abuse." Garcia said there have been shootings, and without the media, one O’odham could have gone to prison for decades. Garcia said that they are bringing these issues to the international arena. Currently, Garcia said the struggle includes fighting new legislation, S750 pushed by Arizona Sen. John McCain, that would waive more federal laws and expand the US Border Patrol jurisdiction along the US border. Garcia said the Tohono O'odham Nation is being used as a stepping stone for actions that could be expanded to other regions. Garcia described the huge surveillance towers now planned for the Tohono O'odham Nation. Lipan Apache from Nogales, Sonora, Mexico, described their struggle for recognizance in Mexico and their difficulty in crossing the border. Mark Maracle, Mohawk Warrior, responded on the issue of sovereignty. "You don't have sovereignty unless you assert sovereignty,” Maracle said. Maracle said Mohawks have stood up against the state police, federal agents and all forms of government. He said it is the same as dealing with bullies and cowards. He said people have to be strong and need assertive, good spokespeople, and not try to use US laws against them. Maracle is speaking because he was given the right to speak by the Mohawk clan mothers. As for Treaty organizations, he said that not one Indian treaty was recognized by the governments. Mohawks go after solutions, he said, they don’t just focus on the problems. During Saturday's afternoon session at AIM West, Pennie Opal Plant spoke on the battle against fossil fuels and plans for the upcoming Paris COP 21 summit. Opal Plant described the Indigenous Women's Treaty of North and South, signed in September. Indigenous women said it "marked a historic milestone in the movement for environmental justice and indigenous rights. Indigenous women leaders of the North and South Americas signed a first ever treaty agreement declaring solidarity in the movement to protect Mother Earth from extractive industries." Casey Camp-Horinek (Ponca) and Pennie Opal Plan (Idle No More Bay Area), who serve as representatives on the Indigenous Environmental Network’s Delegation for the COP 21 United Nations Summit in Paris, met with Kichwa leaders, Patricia Gualinga and President of the Association of Sapara Women, Gloria Ushigua, who serve as representatives of the Amazon Watch Delegation. 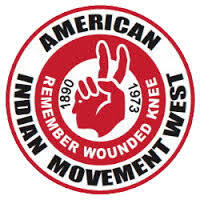 During the afternoon at AIM West, presenters provided information on access to media: U streaming and live streaming events wave of the future; marches, protests. rallies, conferences. 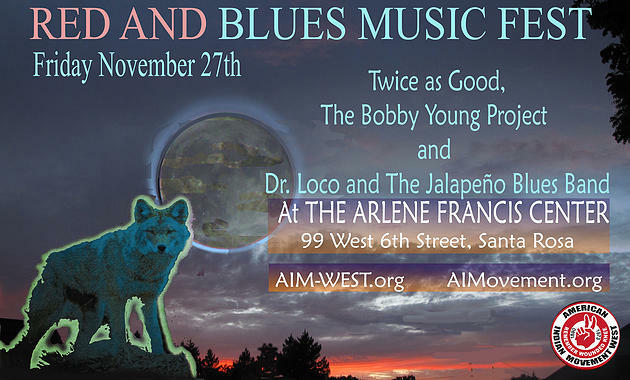 The presenters were Frank Sterling and Steve Zeltzerm KPFA radio. Cristina Gonzales, Chumash, spoke on NAGPRA and the protection of Native American sacred places and remains. 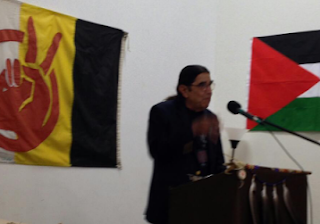 During the opening of the American Indian Movement's west coast annual conference, Tony Gonzales described how Leonard Peltier's artwork was removed in Washington State. 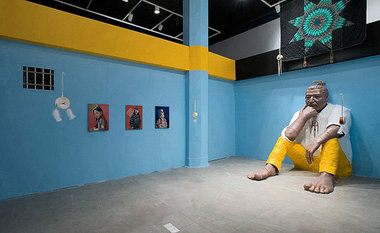 Rigo 23 of Portugal spoke on his art installation of Peltier in San Francisco (below.) Rigo pointed out how Hollywood always has other nationalities to portray American Indians in films. Rigo also described Peltier's love of art. 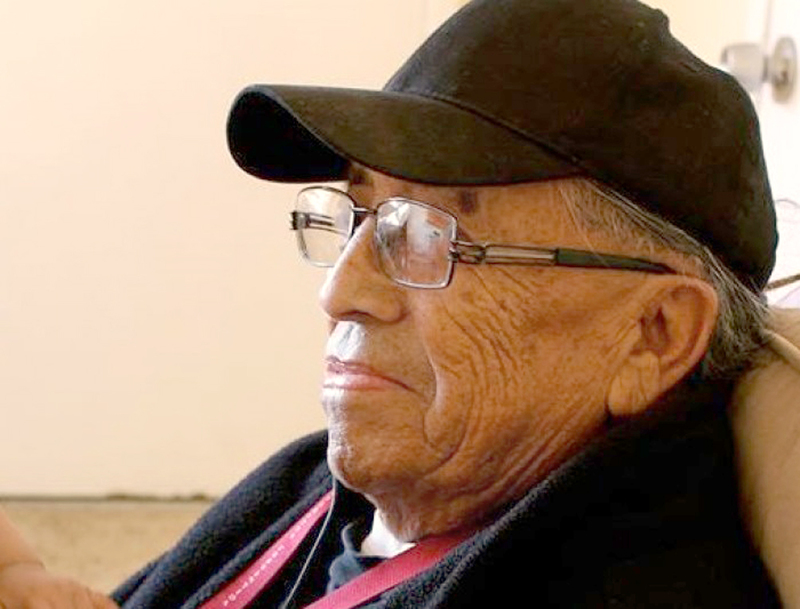 Rigo remembered Leonard and the sacrifice he made when he went to Pine Ridge in the 70s. "Leonard gave up everything he was doing to protect his people from the GOON Squad." Michael Flynn of the National Lawyer's Guild read the letter from the Guild, urging release of Leonard Peltier. It points out the fabricated evidence used in his trial and states Peltier was not allowed a fair trial. It also points out that there is no proof of who shot the two FBI agents on Pine Ridge, for which Peltier, 71, has spent his life in prison for. Jean Whitehorse, Dine', spoke on the trauma of boarding school and the US sterilization of American Indians, which she was a victim of. 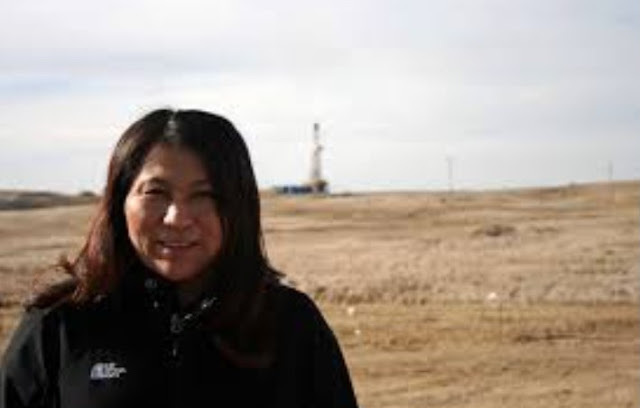 She told of the termination and relocation that the US targeted Native Americans with. Whitehorse spoke of the contaminated water from the recent gold mine spill and the coal fired power plants. She said Navajo ancestors didn't read or write. They put their "X" on documents hoping for a better life. Whitehorse said she hopes for a better life for the children today on the Navajo Nation, where she encourages culturally relevant children's books. She focuses on the chiefs and those Dine' who made a difference. Whitehorse said Navajos were only allowed to become citizens because the United States wanted to use the young men to fight the US wars. Whitehorse said she came to share the struggle. "That's why we are still here." With thanks to the Creator, Wounded Knee offered the closing prayer on Saturday, remembering those suffering from boarding schools. He also remembered Darrell Standing Elk. The Saturday night AIM West Dinner is at Inter-Tribal Friendship House Oakland, 6-7 pm. The AIM West Conference is live again on Sunday. Welcome to the annual AIM-WEST Coast Conference! 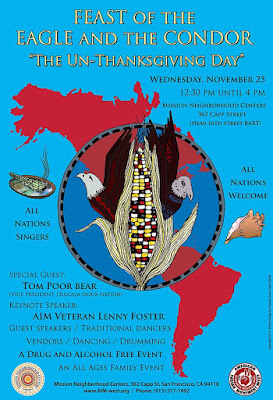 This year’s conference held in San Francisco November 21-22, 2015 is dedicated to the I Will Clemency Campaign for Leonard Peltier! The Conference Agenda provides a guide to topics that will be discussed. There are many issues to be covered so please be thoughtful and respectful of others in your presentations and remarks. Your cooperation is appreciated. The public is invited. AIM-WEST will be live webcast streaming the conference to afford others an opportunity to be part of the discussions and listen to the speakers. When you speak be sure introduce yourself and enjoy the camaraderie as we build alliances across Indian Land in the promotion of Indigenous peoples right to self-determination. 9:30 Solidarity statements from supporters and allies. 1:30 Border Relations: Military Operations and Reservation life, sovereignty and water as humanitarian aid. Presenters Michael Flores, and an Apache video introduction. 2 pm Closing comments and blessings. My country, Newe Sogobia, including Yucca Mountain is not, and has never been part of the US according to the federal statute that allowed Nevada to be organized into a territory and the "supreme law of the land", according to the US Constitution referring to the the 1863 Treaty of Ruby Valley--because America needed allies to win the war against the south...and the Shoshone sacrifice made America this great nation of people. Read them all America and learn something about how the the beautiful Shoshone life-ways are being destroyed by development and testing US/UK weapons of mass destruction, uranium mining, low-level waste (unsafe at any level) and proposed high level nuclear waste disposal. How does American honor the property owners? Those who propose Yucca Mountain in spite of the fact that DOE cannot prove ownership are wasting taxpayer time and money that results in environmental racism against Shoshone people at best, and genocide at worst. We gave notice of our position 10 billion dollars ago and we haven't changed our position, and we cannot, for the future generations.